A New York City subway train holds 1,200 people. This blog was viewed about 5,500 times in 2015. If it were a NYC subway train, it would take about 5 trips to carry that many people. According to VTShome.org, the facilitator responds with nonjudgmental statements restating and clarifying what the contributor has said. They will point out various parts of the painting people are looking at or describing. As the discussion continues, the facilitator links comments together, without adding their own opinion. Why is this kind of discussion valuable? The VTS shows research to indicate this kind of interaction with art strengthens critical thinking skills, which influences academic performance in other areas. For me, interacting with international students by looking at paintings together is fun. It increases their vocabulary and and provides a learning experience for both of us. We, in this instance, are on the same level, looking and observing together. Today I met my Iranian friend. She asked me what I was doing and I showed her the project I was working on: selecting great works of art and connecting them with topics derived from the painting. I asked her the three questions, mentioned above. As she contributed her observations I learned even more about her culture and history. Her comments helped me understand unanswered questions from previous discussions. Many of the discussion guides on this website have paintings in them that you can discuss with your friends. I will let you know when my art discussion project is available for use widespread use. Do you think this kind of resource would be helpful? Anybody who seriously takes the challenge of learning another language is an inspiration to me. This spring, I met Chau, a young woman from Vietnam. She has a master’s degree in physics and her husband is doing research at Kansas State University. Chau began to learn English in her high school years in Vietnam. Mostly the instruction emphasized reading, grammar, and a little writing. Speaking English took place only in the classroom with the teacher. At the university, Chau took a few English classes for physic majors. Before coming to the United States, she took refresher courses at an English center, studying for the TOEIC. She and her husband arrived in Kansas, in March, 2015. As soon as I met Chau, I realized she was a person who was serious about learning English. First of all, she comes to group events like the Conversation Cafe. She is not afraid to use English, smiling all the while. She also attends World Friendship, a community organization for the wives of international students at Kansas State University. At each event, I noticed how eager she was to speak and make friends. When I began meeting Chau for English practice, I knew I was in for a delightful experience. Her determination is inspiring. For one thing, she brings a list of words for me to speak into a recorder so she can practice them for our next meeting. We look up definitions and make up sentences together. During the week, Chau looks at websites like http://learningenglish.voanews.com, www.effortlessenglish.com, and www.notefull.com. She reads books and watches film, with and without subtitles. People like Chau amaze me. They have a big task and work steadily with determination and humor. They are resourceful and courageous. Chau and others will be successful, no doubt. Sometimes questions and problems lead to new solutions. Our Conversation Cafe attendance was lagging a bit in January and February so we, the Bridges International team at Kansas State University, decided to advertise at the dining centers. We wondered what we could do to attract attention that was different from all the other tables students encounter. After brainstorming, we felt we landed on a few good solutions. 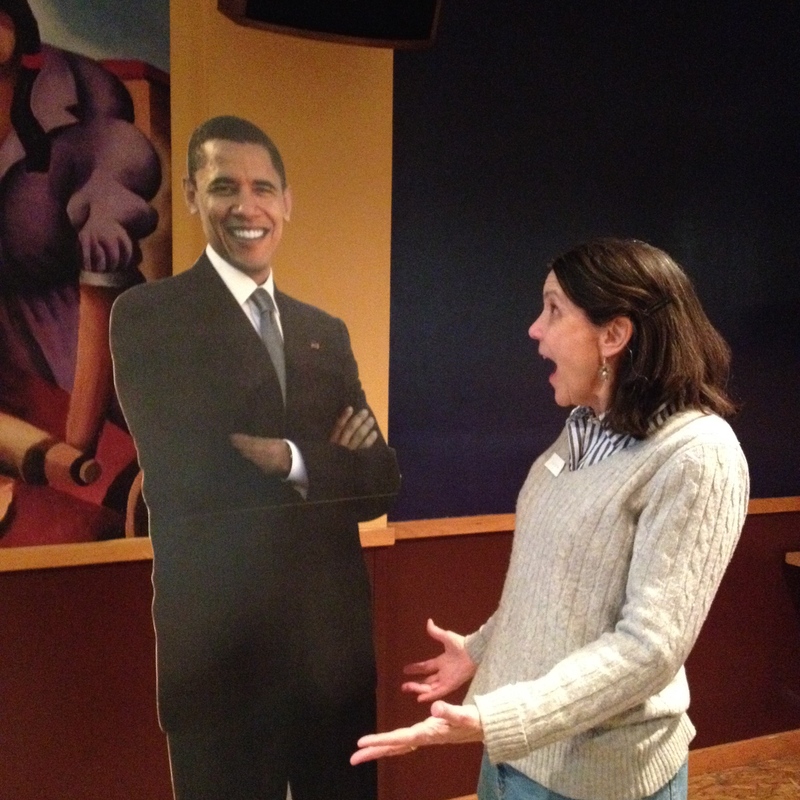 We would buy a life-size cutout of President Obama and provide from some photo opportunities. At the other dining center, we decided to play, “Name that Flag.” At both we would offer a raffle for coffee shop gift cards. Did our efforts pay off? Our attendance was up, in spite of the cold. But as important, our morale was boosted and we had a lot of fun. I wonder what creative solutions you come up with? Questions also prompt new discussion guides. Recently I was asked, “Was it necessary that Jesus died on the cross. Wasn’t it enough that he suffer?” This led to a new discussion guide found under “Topics from a Biblical Perspective.” Earlier someone asked me about the timeline of the Bible. “Old and New Testament Introduction” was the result of that question. There are some new topics under the Lifestyle heading. Look for “The Bucket List” and “Sports Sayings and Idioms.” Some new game ideas are a result of the class I am taking in Creative Drama. January 1 brings to mind the topic of New Year’s resolutions. What changes do most of us resolve to make and how long do we keep our resolutions are good places to begin. I think it is always fascinating to learn about other traditions surrounding the new year. What kind of food do people eat, are there certain clothes that are worn, what do they do to celebrate, and when do they celebrate the beginning of the new year? These questions combined with statistics and a painting are in the new Lifestyle Discussion titled, “New Year’s Resolutions.” Oh yes, if you think it is too late in January to begin a discussion like this, remember that by June, only forty six percent are still keeping their resolutions. I wish you all a happy and successful new year. May your lives be enriched in the love of God and in friendships from around the world. 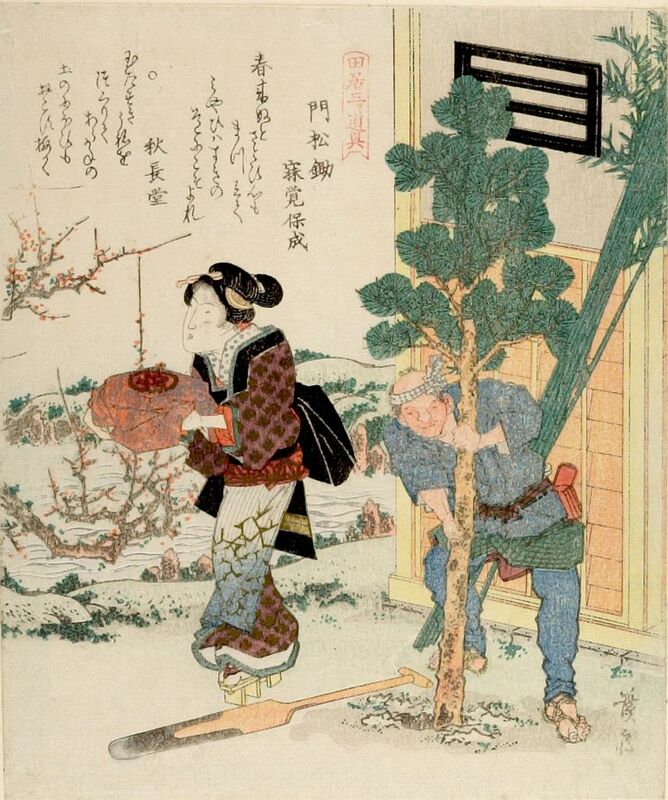 Keisai Eisen, Japanese, 1790-1848. Planting the New Year’s Pine. Print, 20.8 cm x17.6 cm. Harvard Art Museums. When my children were growing up, we made up a game using the daily newspaper. Reading the question sent into an advice columnist like, Dear Abby, we would then each suggest a solution before we read the written reply in the paper. Some of the letters were entertaining and some were quite sad. But in playing the game with my kids, I discovered their perspective on relationship problems. A lot of helpful and funny discussions came from this game. Years later, I met a woman working on her English by reading the newspaper. Specifically, she read, Dear Abby. The conversations we had about the situations in the letters were quite amusing and enlightening for both of us. I found her point of view broadened my understanding of her culture and she was eager to learn how Americans handled difficult relationships. There was usually new vocabulary in the column; some of it was slang, which she was always eager to learn. The Lifestyle conversation on “Advice,” has some examples of Dear Abby letters and responses. You can also Google Dear Abby, and find more letters for English conversation. Learning from each other brings a lot of pleasure. Last Friday, Cru.org published a story I wrote about friendship with international students. I realized the story and this website would not be possible with help from many friends. So I would like to thank them now. Starting with those who patiently used my lessons as they evolved into something better, I’d like to thank Karla and David Dennis, Susan Kejr, Janet Larson, and Darrin Stineman. Many thanks to Bridges International, as they gave me opportunity, leadership, and encouragement along the way. A special thanks to David Stuckenschmidt and Nancy Wallace. Rick James from Cru Press Green, kindly looked over the website in the beginning and gave me helpful suggestions. Becky Thomton refined my story for Cru.org. I am so grateful. My family offered other advice. My brother, Mike Seiler, pointed out I needed to properly identify the artwork. Graham, my son, suggested I use Word Press and introduced me to Creative Commons. Rod, my husband and partner in life and ministry, helped me set up the website and patiently listens to my ideas. I appreciate his kindness and wisdom. Finally, my greatest thanks goes to God: Father, Son, and Holy Spirit. He is the one that gives me opportunity, ideas, motivation, and friends. “From him and through him and for him are all things.” Amen.